» PC Reviews » Best Gaming PC With The GTX 1070, What Should You Look For? « Is The Free To Play Model The Way Of The Future? Best Gaming PC With The GTX 1070, What Should You Look For? Looking for the best gaming PC with a GTX 1070 but don’t know what else to consider? You have to look at all of the hardware to ensure that you’re getting a deal. You have to look at what the PC has to offer for a processor, RAM, storage and any features that it might have. I will share what I think is the ideal PC to go with as well as another PC or a build that will provide a similar, awesome experience. Why Choose The GTX 1070? Before I get into sharing the different PCs and a build idea I’d like to elaborate a bit on why you should be wanting to use the GTX 1070 in the first place. If all you’re going to be doing is gaming at a 1080p resolution screen for most of the time that you spend gaming on your PC then I’d say to save your money and go for a lower priced card. Reason being that, usually for people new to PC gaming, they want the absolute greatest PC gaming experience and you should go for that, I’m not saying you shouldn’t! But you don’t need top of the line hardware if you’re not gaming at the top of the line resolutions. A PC with a 1070 in it should be bought/built if you plan on gaming with a virtual reality headset, if you plan on gaming at 1440p/4K or at the very least plan on doing heavy streaming work. 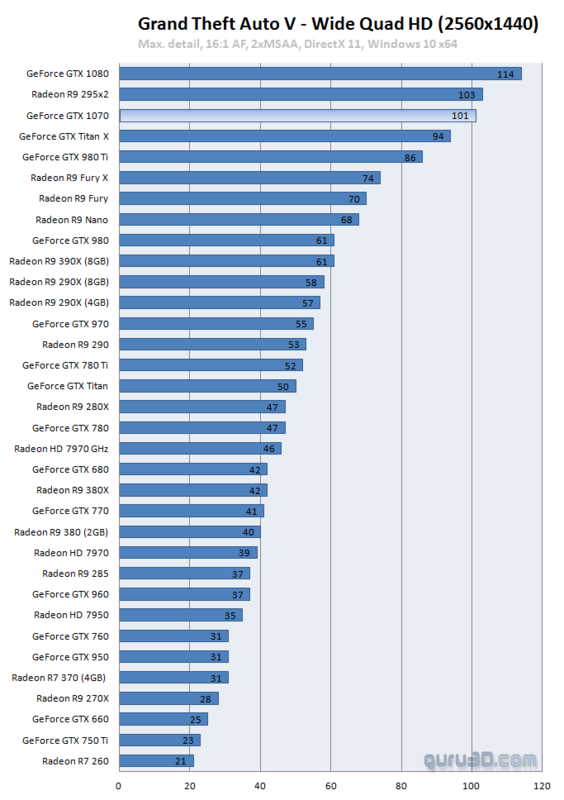 As you can see from these benchmarks, the 1070 is one of the leading cards on the market. 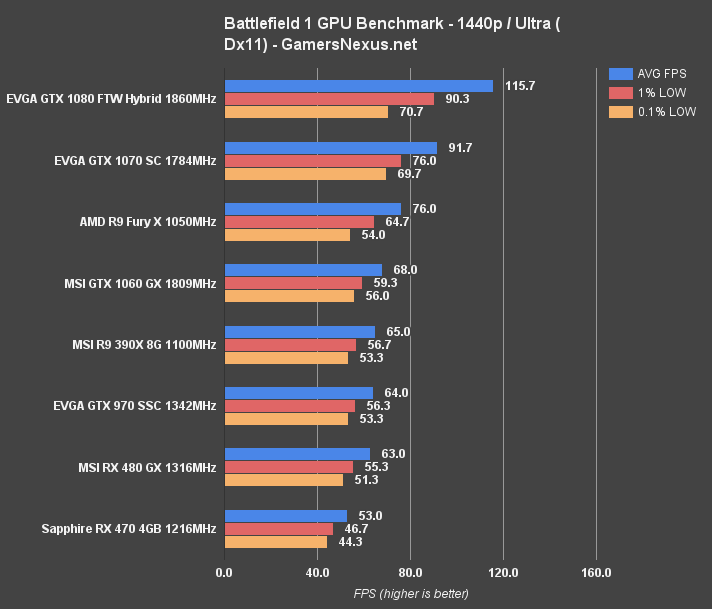 Keep in mind that all of these benchmarks are at 1440p resolution. 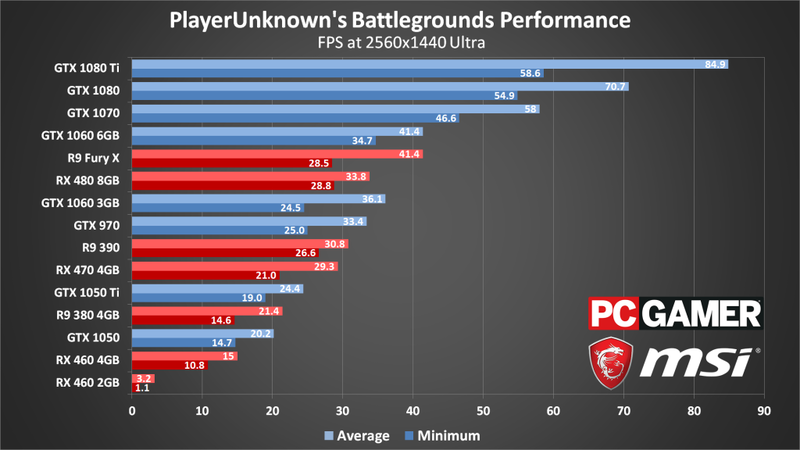 Seeing the overall performance at a high resolution like this should be a clear sign that a 1070 is a card that’s going to stand the test of time. No, you’re not going to be able to use 1440p/4K monitors with a 144hz rate and be able to have over 144 FPS for every single game that you play… But it’s definitely the “go-to” card for the future without absolutely breaking the bank. If all you’re going to be doing is gaming at 1080p and you want high FPS rates there then I’d suggest going with a PC that includes a GTX 1060. If you’re going all-in and want a 1070 then read on. Assuming that you initially want to see pre-built gaming PCs with the 1070 inside, I took a look around to find some of the PCs that boast using the power of this video card. If you’re wanting the most bang for your buck on a pre-built PC then I’d recommend going with the AM002i model from iBUYPOWER which I’ve actually already wrote a more in-depth review on a while ago, you can check it out below. Be sure to check out that review, I go over how you might be overpaying by a small bit for the PC but that it definitely delivers on the performance. Not for everyone price wise but you shouldn’t think that you’re going to get the best performance power per dollar spent by getting something that is pre-built. The rest of the hardware add up and for the price you pay to have something working right out of the gate it isn’t too bad of a deal. 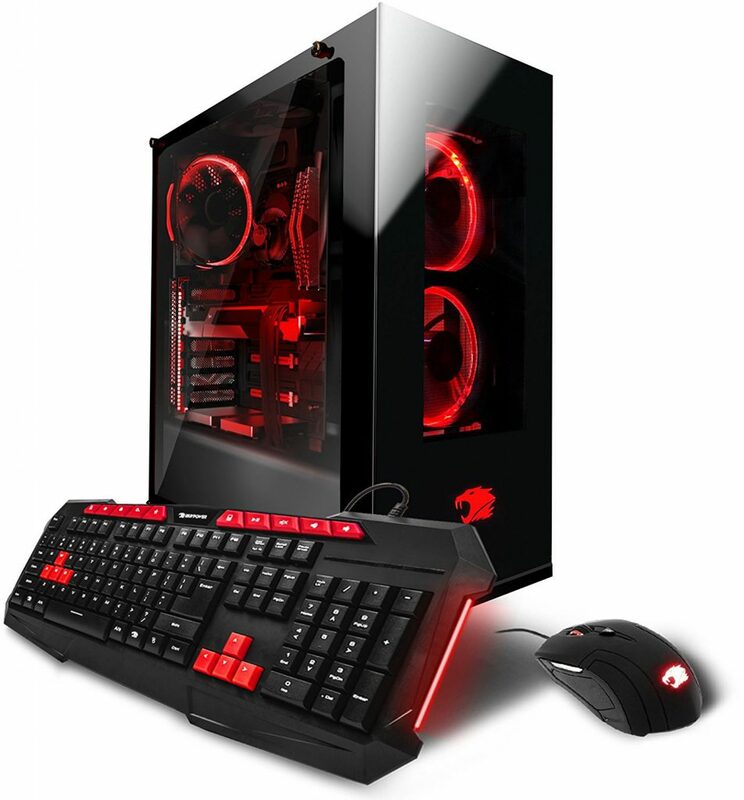 It also comes with a keyboard/mouse combo which at a price point like that, you’d sure hope it would anyway! Combining the i7-7700 with the 1070 along with 16GB of RAM while also being able to include a solid state drive for a fast booting process the OS and for most of your programs… It’s definitely the first one I’d recommend considering. 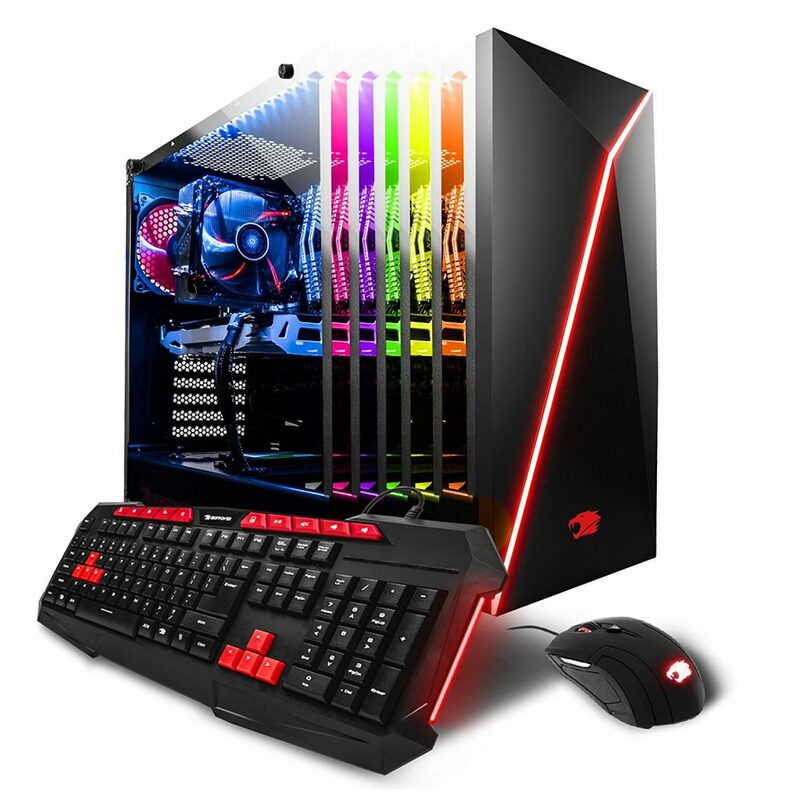 There are other choices as well and this is where things get sort of interesting because although there is quite a boost in pricing with the different PCs, there really isn’t a whole lot of differences with the hardware. When you take a look at the AM900Z model for example, the only real difference is with the processor. It instead uses the i7-7700k. I could see those that are interested in playing around with processors and overclocking that would want to have this PC over the AM002i model. You’re not able to overclock the stock i7-7700 but the i7-7700k is able to be overclocked. With that, this PC uses a Deepcool air heatsink cooler instead of a stock one so that you’re able to do so. It’ll come with the turbo frequency right out of the gate and you’d be able to adjust it however you wanted within the BIOS later. Other than that, there aren’t any significant other differences other than being able to change the lighting with the PC and having 120GB more with the solid state drive storage. So for $200 more you get an overclockable processor along with double the amount of SSD storage space. It’ll come down to what you value most, between the two I’d save money and go for the other model. Now let’s take a look at a PC from another brand, CyberPowerPC. This model is differentiates itself by using the latest Intel generation Coffee Lake. It’s using an i7-8700k which when compared with the i7-7700k in gaming specifically, there isn’t too much of a significant difference. Sure, in some titles you can get maybe 10-20+ FPS at times but for the most part there isn’t anything crazy for differences there. But for other tasks such as heavy processor rendering, encoding and etc. for content creators there is a big enough difference where I could see that getting the latest from Intel is justified. I can see those that are wanting the absolute newest technology and hardware to be interested in this model. Another noticeable difference is that it has a 2TB hard drive with the 120GB SSD instead of the other way around. Oh, and we can’t forget about the RGB controller… you’ll be able to change the lighting on the fly. 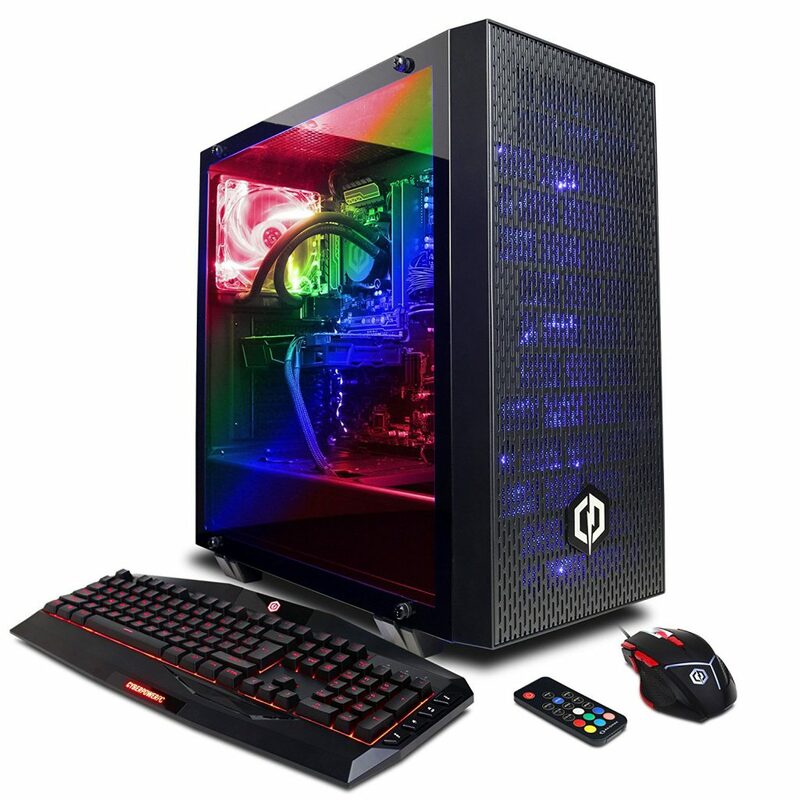 For the last pre-built PC that we’ll look at we’ve got another from CyberPowerPC. This one isn’t using a Coffee Lake CPU… This time we’re headed into Ryzen territory. That’s right, this PC is using a Ryzen 5 1600X. This is a pretty awesome CPU – especially for those of you that are into editing videos and what not. It’s true that at it’s base level, it’s not as great of a gaming processor compared to the Intel processors that the above PCs are using. But with a slight overclock, you’d be getting very similar performance. There’s only one problem with that though… I see a decent amount of the reviews on Amazon mentioning that they decided to switch out the CPU cooler for something better in order to be able to overclock. This PC is going to be for those that are heavily interested in Ryzen and wanting similar specs to the AM002i model from iBUYPOWER. Otherwise the other PCs are the better pick, though this one was still worth mentioning. What is also worth mentioning is that it doesn’t take a computer scientist to put your own PC together. If you’re interested in saving more money, you’ll want to consider building your own PC. There are loads of guides here on the site that will help you tremendously in getting a PC build put together. If you’re looking for a gaming PC build with a GTX 1070 then I’d suggest starting at the $1,000 range and going from there! That guide includes using a GTX 1070 and is definitely prepared for whatever you’d throw at it! Building a PC will save you money on the hardware side for sure. So, are you going to be picking up one of the pre-built PCs mentioned here? Or are you looking at possibly building your own PC with a GTX 1070? Tagged gtx 1070, gtx 1070 gaming pc, pc build with gtx 1070, prebuilt gaming pc, premade gaming pc. Bookmark the permalink. 4 Responses to Best Gaming PC With The GTX 1070, What Should You Look For? Thanks for the post on finding the best gaming PC with the GTX 1070. You have provided in-depth information in this post. 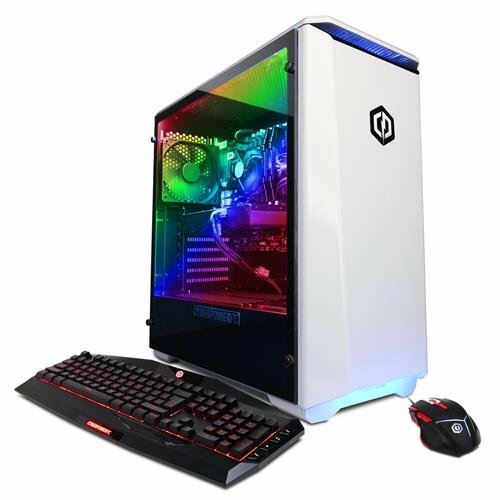 A friend and I are interested in getting a high end computer and we’ll discuss whether or not we’ll build our PCs or if we’ll go with one of these pre-built PCs instead. The stats you gave on why you should choose the GTX 1070 is mind-blowing, it’s a very powerful card! Also, thanks for the recommendation on pre-built PCs. I’m happy to hear that you found the post helpful! You might be able to save a little bit of money by doing a build of your own, but you can also get a very high quality PC that’s ready to go right away with any of these pre-built rigs that are listed. Let me know what you decide to do! Always here to help! You are the best. From this article, you have made me decided to carry on with the GTX 1070. I have bought the GTX1070 and build the CPU. I have not bought a monitor yet. Which gaming monitor would you recommend for me so I can have the best picture quality to use with the GTX 1070 graphics card? Hey there Kit, I’m glad you enjoyed the post and that I have helped out! For the 1070 I’d recommend either going with a 1080p monitor with 144hz refresh rate such as this one from Asus or you could go with a nice 1440p monitor such as this one from Dell – you’ll want to utilize all of the performance power of the 1070 that you can.